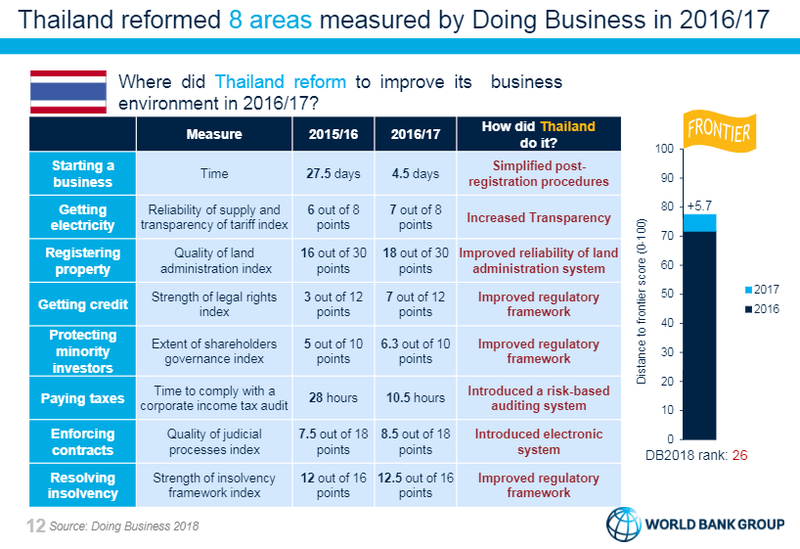 One of Thailand’s greatest success stories in 2017 was seeing its reputation as a destination for business events elevated by the World Bank Group’s latest Doing Business Thailand’s position in the report, a measure of the ease of doing business in 182 countries around the world, rose from 48th to 26th – overtaking countries including Japan. More impressively, Thailand was among the top 10 countries to see economic improvement across three or more areas. In total the World Bank picked out eight specific types of business operation to be enhanced by recent reforms, including protection for minority investors, enforcing contracts, securing credit, starting a business and getting electricity. This improved rating demonstrates our government’s commitment to assisting exhibition organisers and participants keen to tap trade opportunities in the ASEAN. We experienced high levels of investor interest this year from Asia, Europe, the USA and newer markets such as South Korea. So the fact the World Bank noted our efforts to make starting a business easier by, for example, abolishing the requirement to obtain a company’s seal and strengthening access to credit by broadening the scope of assets available as collateral, should convince organisers there is a transparent and straightforward business environment for them in Thailand. But don’t take our word for it, take the word of Ulrich Zachau, World Bank Director for Thailand, Malaysia and Regional Partnerships. He said Thailand has made “immense progress” in business reforms this past year, with strong government leadership at the highest levels. “With its 26th place ranking, Thailand has risen into the top 15 per cent of countries globally in the ease of doing business – a great achievement,” he said. Thailand’s dedication to the innovative industries that lend themselves to international partnership – a consequence of the government’s Thailand 4.0 programme – also eases business operation by encouraging cooperation between the government and private sector to support innovation and digitalisation of the country. The exhibition industry, as a platform that publicises technology and commercialises transactions between new business and start-ups, is actively promoting these types innovative and emerging industries – giving such companies a direct route to market and aiding the engagement of local suppliers and buyers with visitors and exhibitors from around the world. And the fact companies importing certain goods for international events can do so with import duty relief, provided these goods are re-exported within a time limit determined by the Customs Department, is one less barrier to entry. Our focus is on the whole industry. Our supporting scheme ‘Premier Exhibition Access Program’, for example, helps create business opportunities for exhibition organisers who seek to bring international exhibitions to Thailand. This campaign has already yielded one major success in Thailand being chosen as host of the renowned exhibition Future Energy Asia, organised by DMG Events Global Energy and scheduled to take place on 12-14 December 2018. We hope our efforts to make Thailand a simpler place than ever for international organisers will make 2018 a year of many more.